New this year! 1 Mile Fun Run or Walk, for those who want to join in the fun but don’t want to do the distance! 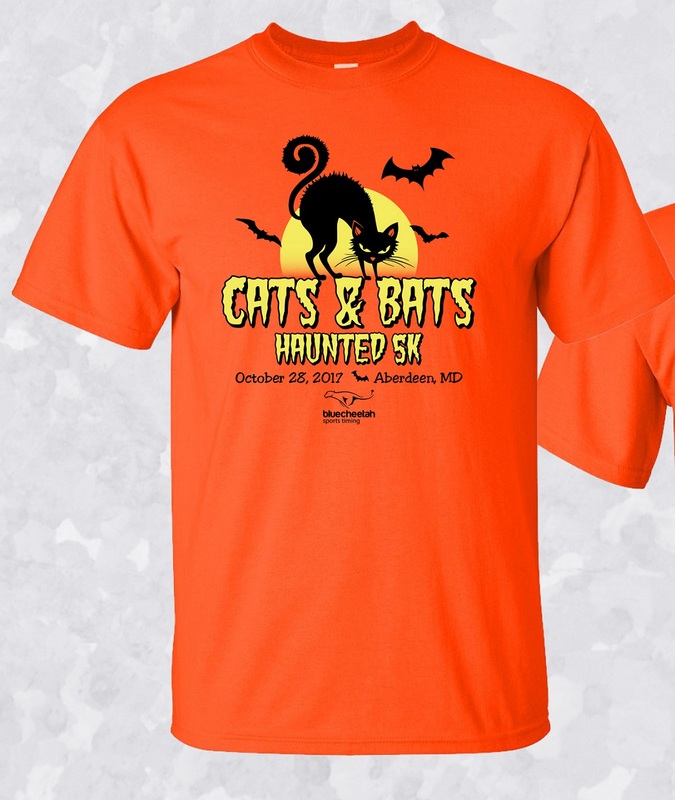 Custom event shirt and commemorative race bib are included. 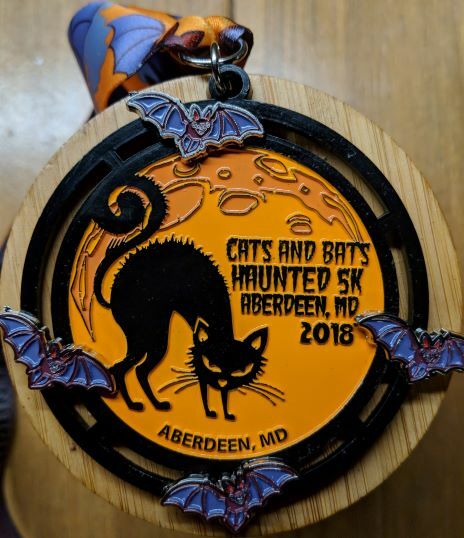 ALL REGISTERED 5K PARTICIPANTS WILL RECEIVE OUR FANTASTIC FINISHER’S MEDAL! Custom event shirt for all registered by October 18. We do our best to order enough for all who register but if you register after October 19, we can’t guarantee size or availability. Please Register Early to Ensure Your Spot. You May Register Below at Active.com Or You May Download Our Mail-In Registration form and Mail Your Payment by Check or Money Order. The Cost is $25 Per Person if you Register in Advance, $30 Per Person During Packet Pickup or Race Day. 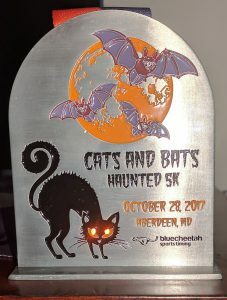 The Cats & Bats 5k is the second race in Blue Cheetah’s annual holiday running series. This year’s event will take place on Saturday, October 27th, 2018 at 8:00 AM sharp at Festival Park in Aberdeen, MD (click for Google Maps link). 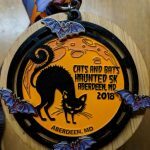 As with every race in the series, the Cats & Bats 5k features a Custom finisher’s medal for all participants, as well as a custom 50/50 cotton and poly tech-blend short sleeve t-shirt, plus other great swag. The race will be professionally chip timed using the RaceResult system by Blue Cheetah Sports Timing and Event Management, LLC. A portion of the proceeds from this race will go to benefit the National PTSD Foundation, a 501(c)3 public charity dedicated to helping first responders suffering from post-traumatic stress disorder. There is ample, on-street parking in and around the event. Please be respectful of our neighbors and avoid parking on private property or in areas clearly marked for residents. Aberdeen is welcoming and safe, but as with any city it is wise to secure your valuables out of sight and to also ensure that you lock your vehicle during the event. There will be no bag check at this event since you will be in relatively close proximity to your vehicle. Please take a moment and pay close attention to where you park your car. Getting towed will ruin even your best PR time. Swag: (also known as any freebies or goodies you get as part of the race) This event is unparalleled in 5k swag. 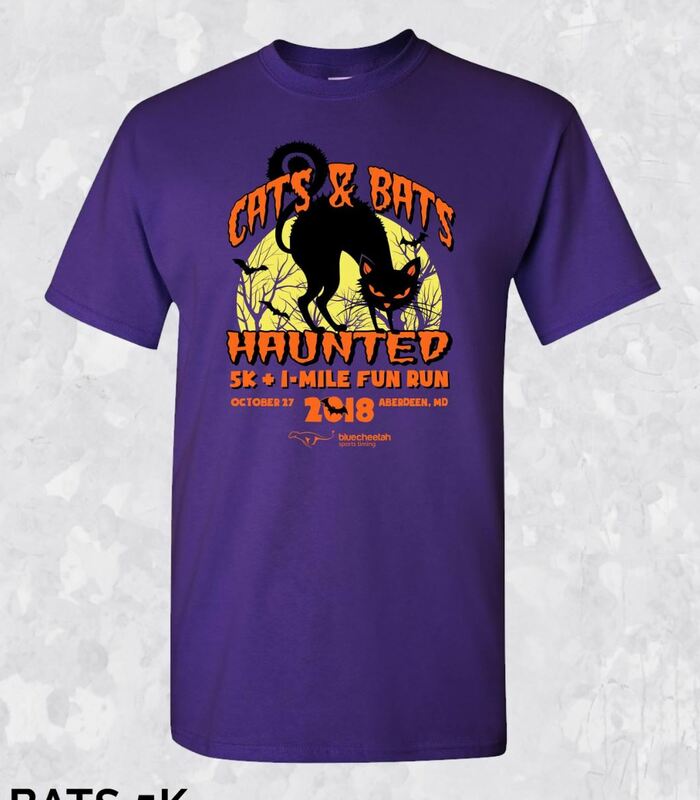 Each pre-registered participant will receive a custom, full color, 50/50 blend t-shirt (not a cheap 100% cotton version) water, snacks, fruit, and sponsor giveaways. Additionally, every 5K finisher will receive a custom Finisher’s Medal as seen above. 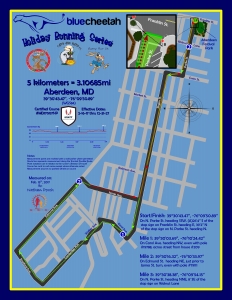 The second option is to pick up your packet on the morning of the race. Packet pick-up will begin at 6:30 AM and will run until 7:45 AM. Participants are STRONGLY URGED to utilize the off-site packet pickup opportunity on Thursday evening as race day pickup can be very busy and we must start the race on-time in order to comply with police and permit restrictions. If you are picking up a bib and shirt for another person YOU MUST HAVE A SIGNED LETTER or email from that person giving you permission to do so. We hate to be sticklers about this, but there are lots of mean people out there who want to steal your shirt, so this is a must. No exceptions. Sorry. All participants must be registered before 12:00 AM on Monday, October 22rd, 2018 in order to receive a shirt in their choice of size. 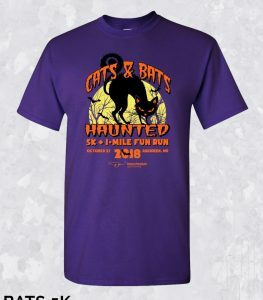 Those registering after that date should receive a shirt but the size or availability is not guaranteed and we will ask you to pick up your shirt after the race. Onsite registration will be available during the Thursday evening packet pick-up event, as well as on race day, ONLY IF THE RACE HAS NOT SOLD OUT. If the race has already sold out, this website will be updated with that information. Please do not rely on information from other websites, random strangers at the supermarket, or your dog groomer. 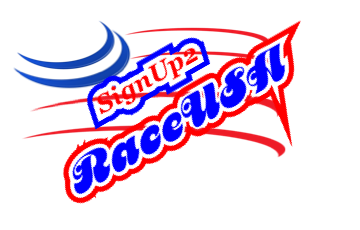 All official communications regarding this race’s registration status will appear on this website ONLY. Same-day and packet pick-up registration fee is $30, while spots are available. CASH, CHECKS OR CREDIT ACCEPTED AT PACKET PICKUP, CASH ONLY ON RACE DAY if registration is still open (super-duper doubtful). This event will be professionally chip timed and scored by Blue Cheetah Sports Timing & Event Management, LLC, using the disposable RaceResult chip system. On the back of your race bib is located a foam “chip” which records your time. Do not bend, damage, cover, remove, feed to your dog, get wet, or otherwise mangle this device if you would like an accurate time for your running or walking effort. Bibs must be worn on the front of the body, horizontal, and on the outermost layer of clothing. Improperly affixed bibs may result in no reads. Remember, a missing or improperly affixed bib equals no official time! Be sure to run across BOTH sets of timing mats at the start and the finish lines of the race. Remember, pain is temporary, but internet race results are FOREVER! Please take a few extra seconds to get this part right. Also, please do not puke on the mats. Our timers thank you! IMPORTANT NOTE FOR PARA-ATHLETES: If you are a para-athlete or are running with or on behalf of a differently-abled participant, please contact us directly. We will be creating awards categories based on the number of participants in this sector. If you are a 42 year old ultra-marathoner and you are running with a ten year old para-athlete for example, we want to ensure that we have a special category for you. By doing this, we are able to ensure that non para-athletes in the same age category are able to get the awards they earned as well. Our contact information is at the bottom of this page. There will be first, second, and third place awards for best costume, or group costume. The judging process for this is highly advanced and technical. We will bring you up on stage, and using our very scientific method (a sound decibel meter), we will ask the crowd to cheer as loudly as possible for their favorite get-up. If you have a lot of really loud friends, bring them to the race. You could win even if your costume isn’t all that fantastic! Be creative, have fun, and set a PR while running as a giant pumpkin! Results will be updated on results kiosk screens in real time during the race. Official results will also be posted to www.bluecheetahtiming.com/results following the race. 1) Smile and be nice. This a charity event, and it is run mostly by volunteer labor. 2) Read all of the stuff above this section. It’s important. 3) There are things in here that are meant to be funny so you don’t lose interest while reading. If you took offense to anything, it’s the race director’s fault. We told him not to write it. 4) Your Race Director is Chris Shelton. He’s the only person you are allowed to yell at. 5) I wouldn’t yell at Chris Shelton, but if you do you must bring him coffee and a donut. 7) If whatever you are running with poops, please clean it up. This also applies to your friends. 8) Finish line stays open for 1H 15M. Trust us, you’ve got this. 9) If we made you laugh, share with a friend. If we didn’t make you laugh, please share with a friend. THIS RACE PROUDLY SUPPORTS THE NATIONAL PTSD FOUNDATION, AN IRS CERTIFIED 501C3 PUBLIC CHARITY DEDICATED TO RAISING AWARENESS AND HELPING OUR NATION’S FIRST RESPONDERS THAT ARE SUFFERING FROM POST TRAUMATIC STRESS DISORDER TO LEAD HAPPY, FULL AND PRODUCTIVE LIVES. Thank you, and we look forward to seeing you at the race! I UNDERSTAND THAT RUNNING A ROAD RACE IS A POTENTIALLY HAZARDOUS ACTIVITY. I SHOULD NOT ENTER AND RUN UNLESS I AM MEDICALLY ABLE TO DO SO AND PROPERLY TRAINED. I AGREE TO ABIDE BY ANY DECISION OF A RACE OFFICIAL RELATIVE TO MY ABILITY TO SAFELY COMPLETE THE RUN. I ASSUME ALL RISKS ASSOCIATED WITH RUNNING IN THIS EVENT INCLUDING, BUT NOT LIMITED TO: FALLS, CONTACT WITH OTHER PARTICIPANTS, THE EFFECTS OF THE WEATHER, INCLUDING HEAT/HUMIDITY, TRAFFIC AND THE CONDITIONS OF THE ROAD AND ALL SUCH RISKS BEING KNOWN AND APPRECIATED BY ME. HAVING READ THIS WAIVER AND KNOWING THESE FACTS AND IN CONSIDERATION OF YOUR ACCEPTING MY ENTRY, I FOR MYSELF AND ANYONE ENTITLED TO ACT ON MY BEHALF, WAIVE AND RELEASE BLUE CHEETAH SPORTS TIMING, LLC., AND ALL SPONSORS, MUNICIPALITIES,THEIR REPRESENTATIVES, AND SUCCESSORS FROM ALL CLAIMS OR LIABILITIES OF ANY KIND ARISING OUT OF MY PARTICIPATION IN THIS EVENT EVEN THOUGH THAT LIABILITY MAY ARISE OUT OF NEGLIGENCE OR CARELESSNESS ON THE PART OF THE PERSONS NAMED IN THIS WAIVER. I HAVE READ THE LIABILITY WAIVER AND UNDERSTAND THE INHERENT RISKS WITH THIS ACTIVITY. I GRANT PERMISSION TO ALL OF THE FOREGOING TO USE ANY PHOTOGRAPHS, MOTION PICTURES, RECORDINGS, OR ANY OTHER RECORD OF THIS EVENT FOR ANY LEGITIMATE PURPOSE. I CERTIFY THAT I AM 18 YEARS OF AGE OR OLDER, OR THAT I AM THE PARENT/GUARDIAN OF THE ENTRANT AND AM GRANTING PERMISSION FOR HIM/HER TO PARTICIPATE IN THIS EVENT. IF YOU HAVE A QUESTION OR COMMENT ABOUT THIS EVENT, PLEASE LEAVE IT BELOW SO THAT WE CAN ANSWER IT FOR THE BENEFIT OF ALL RUNNERS AND WALKERS IN THIS EVENT. Can’t wait! This was a great race last year.